The MetService says thunderstorms bringing heavy rain could strike in Dunedin and other parts of the South this afternoon. In its latest thunderstorm outlook the MetService said there is a moderate risk of a few thunderstorms about northern Southland and Otago this afternoon. These thunderstorms could bring heavy rain of between 10mm and 20mm an hour. Thunderstorms are also possible in other parts of the South Island, including the rest of Southland where there is a low risk of them occurring this afternoon and Canterbury where there was a low risk this evening. 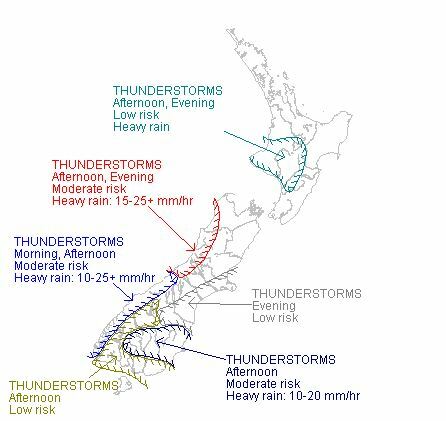 There is moderate risk of thunderstorms about southern Westland and Fiordland this afternoon and northern Westland and Buller this afternoon and evening. These thunderstorms would boost local rainfall rates and a severe weather watch for heavy rain was in place for these areas. The risk of thunderstorms comes as a cold front in the Tasman Sea moves across the South Island today. In the North Island, there is a low risk of a few thunderstorms about Taumarunui, Taupo, Taranaki, Taihape, Whanganui and northern Manawatu this afternoon and evening.